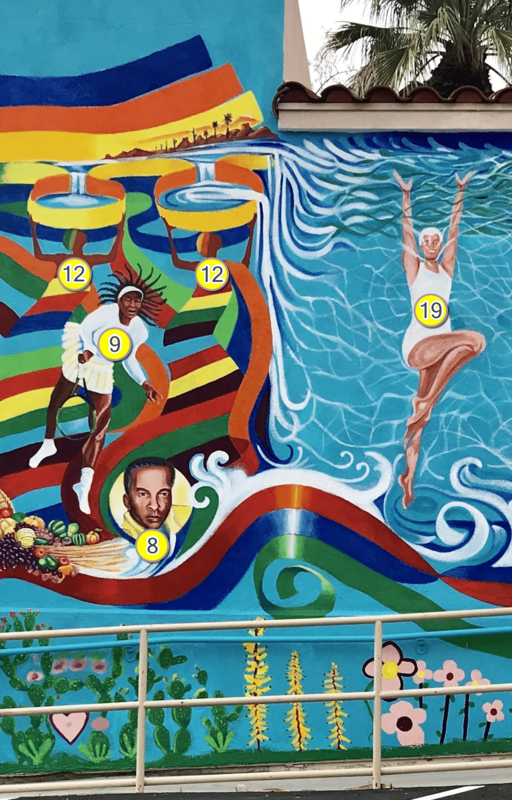 Water, Earth, Wind, and Fire are evident across the Mural. Water and agriculture are what led to the Palm Springs area being settled. The water is prominent in the very life of the Valley and in the recreational uses of the desert. 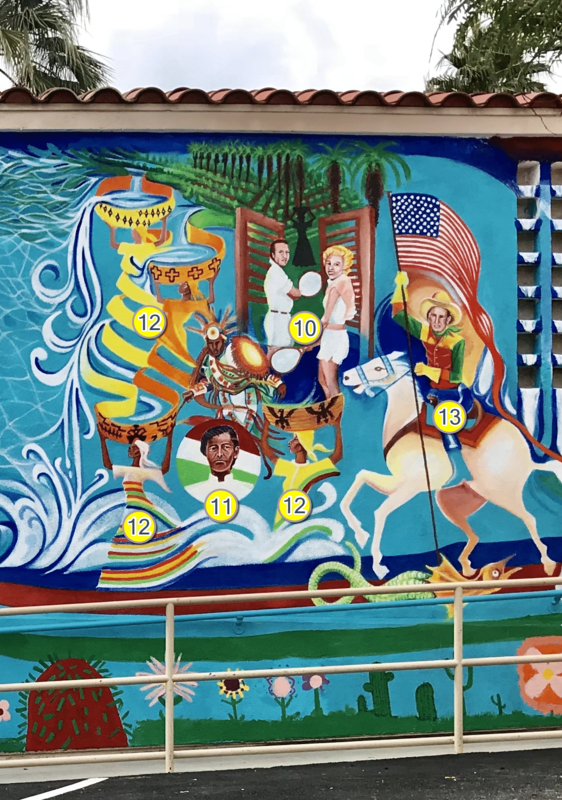 In this Mural, the Wind is constant – as it is in the desert – and Water is sacred. 1) Lions – Symbol of St. Paul of Thebes. The lions buried him. 1) Raven carrying bread – Symbol of St. Paul – brought ½ “loaf” each day for 91 years. 1) Icon of Paul of Thebes – Parish Patron Saint. C. 227-341. He fled the city and lived in a cave for 91 years. Most of our knowledge of Paul comes from his meeting with St. Anthony of Egypt near the end of his life. 2) Our Lady of Guadalupe – An important religious icon across the Coachella Valley. 3) Martin Luther King, Jr. – A symbol of Civil rights. 4) The Rev. Fred Barnhill – Rector of St. Paul’s 1959-1965. Along with other clergy from the Episcopal Diocese of Los Angeles met Dr. King in Montgomery, Alabama on March 24, 1965. 5) The Rev. Jeff Rollins – Pastor of the First Baptist Church of Palm Springs for 42 years. Marched with Dr. King. 6) Rabbi Joseph Hurwitz – Rabbi of Temple Isaiah for 41 years. Marched with Dr. King. 7) Woman in Red symbolizing the retention of African Spirits. 17) Horn of Plenty representing abundance of Valley Agriculture. 18) An anniversary “Chip” signifying another year of sobriety in AA. One of the first AA Meetings in Palm Springs started in 1948 at St. Paul’s – and is still meeting! The “chip” used as a model was for 32 years of sobriety. 8) Lawrence Crossley was one of the first African-American residents of Palm Springs. He designed the first Golf Course in Palm Springs at the El Mirador Hotel. 9) Serena Williams – A recent sport icon who participates in building bridges of mutual respect as a woman of color and is attraction for the Coachella Valley playing regularly in the Indian Wells Masters Tennis Tournament. 12) Seven Water Bearers, represent the different indigenous tribes of the region. The basket designs are from historic Cahuilla baskets. 10) George Montgomery and Dinah Shore – Icons of Palm Springs’ golden age, whose home is near the church. 11) Cesar Chaves was a civil rights, Latino and farm labor leader. He led a march through the Coachella and Imperial Valleys in 1969 to protest against the actions of growers. 13) The iconic St. George and the Dragon is rendered modern with Gene Autry on the Horse – A local iconic hero. 14) Five displaced persons or persons immigrating or refugees. 15) Indigenous people of Mexico with colors of the Mexican Flag, connecting with colors of the American Flag. 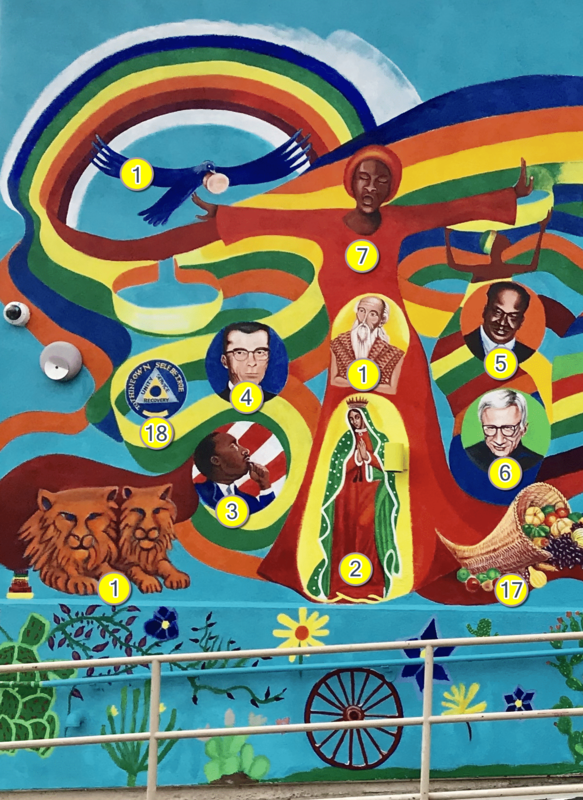 16) The desert plants and flowers along the lower portion of the Mural were painted by 17 young women from the Rites of Passage program of BRAAF (Building Resilience in African American Families) on January 2, 2019.